Share booth #511 with others. The Speedy Wet Cadet® Liquid Unit Dose/Barcode packaging system uses thermal transfer printing. The Speedy Wet Cadet® can be used for small runs of 5 to 10 doses at a time or much larger runs of 100’s of doses at a time. The accuracy is +/- 1% with volumes from 1 ml. to 30 ml. Customers use the Speedy Wet Cadet® for non-available or non-barcoded liquid unit doses, or to save money by buying in bulk and repackaging (sometimes saving up to $1.00/dose). The AccuPack-SX® will package large items such as ampoules, vials, suppositories, syringes, etc. It will also package multiple item “kits”, and replenishment or par value packages to be sent to storage cabinets at the nursing station. Packaging speed is up to 35 per minute. A quiet, internal source of air blows open each bag without the typical noise of machines which use an external air compressor. Package sizes go from 2.0” wide x 4.0” high up to 9.0” wide x 12.0” high with different types of materials available. Numerous AccuPrint® Thermal Transfer Printers are available for printing black and white or color barcode labels, product identification and other kinds of labels for pharmacy use. The labels can be very small labels, “Flag Labels”, or larger labels. 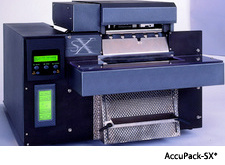 Our AccuPrint 600™ can print Multi-Flag labels ( U.S. Patent) with a 600 dpi print quality. The widths can be as small as 0.5” up to 8.0”. Label design software and on site training are included.